All of these actions begin on the Users & Groups screen. To open it, click your username in the top right corner to expand the account management dropdown, then select Users & Groups from the dropdown. 1. Find your parent group. Navigate your group hierarchy to the group that you want to be the parent of your new group. In the example below, the new group will be a subgroup of “Eastern Region”. You can see this by looking at the breadcrumbs in the top left. 2. Create the group. Click the Add Group button at the top right of the Users & Groups screen. The Add a Group window pops up. Note the lock icons next to several of the permissions. These permissions are “locked in” and cannot be taken away. 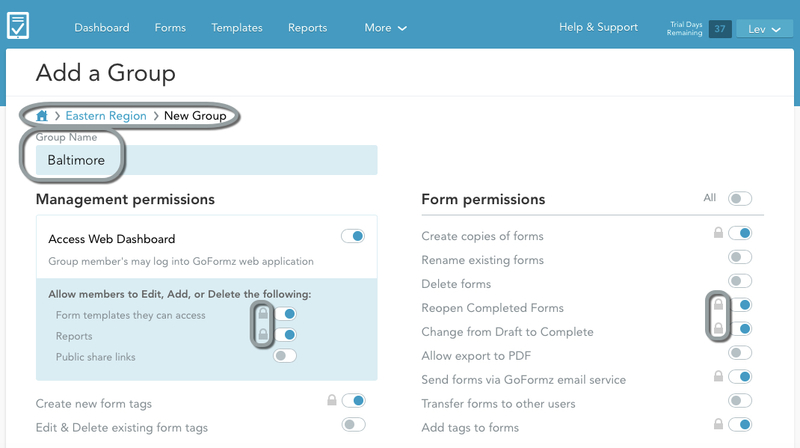 This is because the group’s parent (“Eastern Region”) has these permissions, and permissions are additive in GoFormz — so your new group must have at least all the same permissions as its parent. 3. Name your group. Enter a name for your group in the Group Name field. In this example, our group is called “Baltimore”. Management permissions. In the example below, group members will have edit access to form templates reports, but not to public share links. They will also be able to both create and edit/delete form tags. Form permissions. 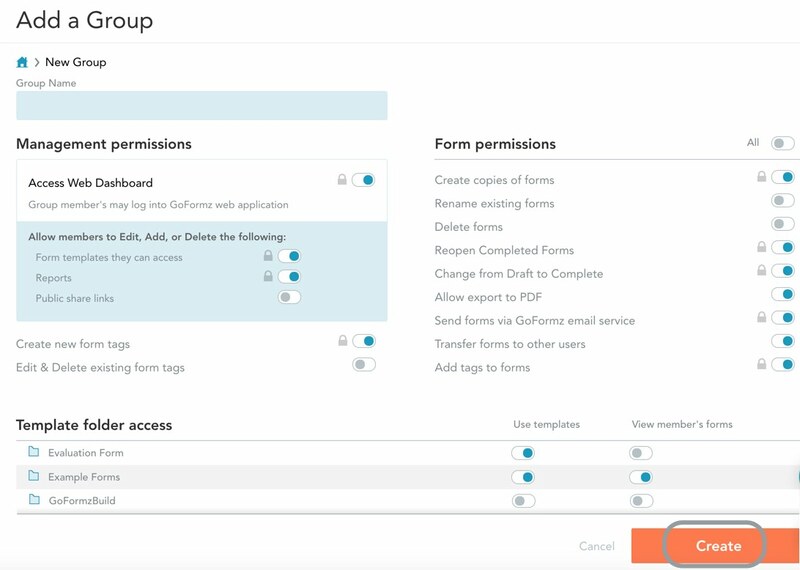 In this example, the group has permissions for all form tasks, except form deletion and reopening completed forms. Set template folder permissions. If you have template folders in your GoFormz account, set those permissions at the bottom of the window. 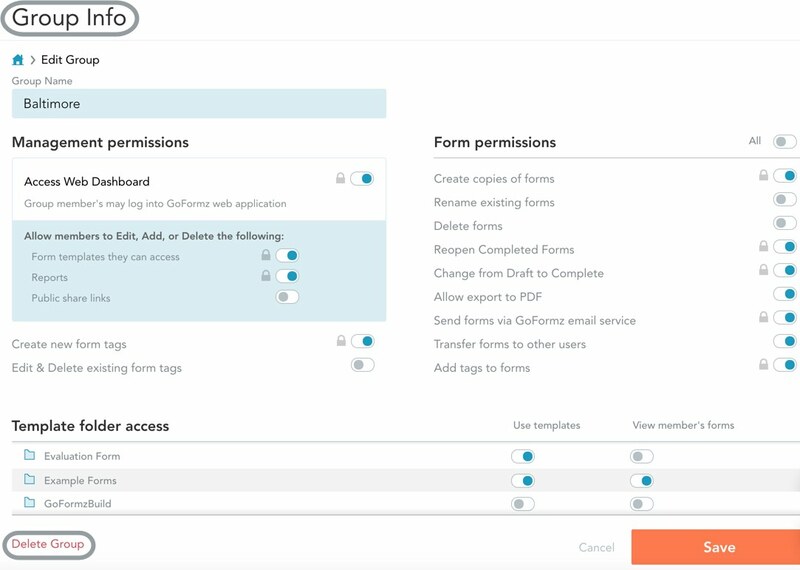 In this example, the group has only the “View member’s forms” permission for Repair Forms, only the “Use templates” permission for Evaluation Forms, and both permissions for the Inspection Forms folder. See here for more on permissions, including a list of all available permissions and what each one does. The permissions you set here are not set in stone -- you can change them later by editing the group. 5. Save your new group. Click the Create button to finish creating the group. You will see the new group in the list. Click the user’s name in the user list to open the View or Edit User Info window for that user. From the Add Group(s) dropdown, select the group or groups to which you want to add this user. 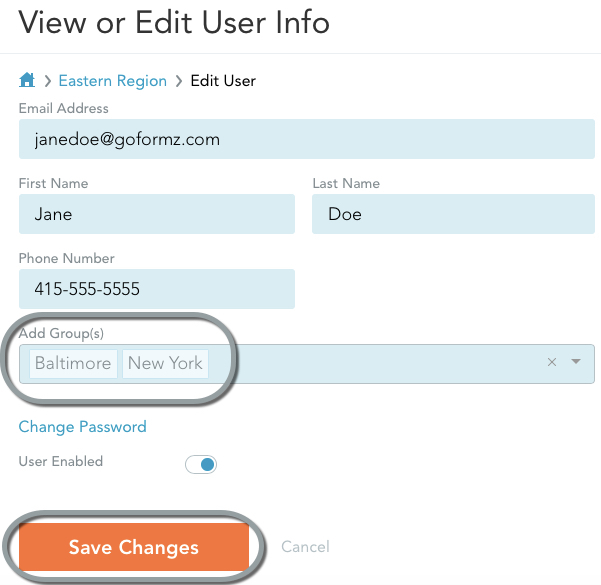 In the example below, user Jane Doe is being added to the “Baltimore” and “New York” groups. Click Save Changes to complete the operation. To edit an existing group, navigate to the desired group and click the Group Settings button in the top right. The Group Info window will appear, displaying your group permissions. Change the group’s name and/or permissions here as you would when creating a group, then click Save to save your edits. Note that adding or removing permissions from an existing group will not necessarily affect its descendants. To delete a group, navigate to the desired group and click the Group Settings button in the top right. In the Group Info window that appears, click the red Delete Group link in the bottom left corner. Then click Delete in the confirmation dialog box. Deleting a group will not delete any of the users in the group, but it will delete all of the group’s subgroups — so be careful when taking this action!